Do you need music theory books for your students, or are you a flute player looking to improve your understanding of music theory? Have a look at the titles below. 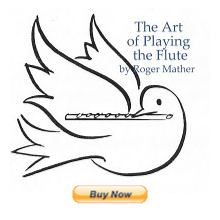 There are several theory workbooks specifically for flute students (and very young flute students also) that have been suggested by other flute teachers in various flute discussion groups. 1. "Explorations in Music", by Joanne Haroutounian. There are 7 workbooks in this series. All come with CD's for ear-training. They cover everything from the very basics for children of age 6-9 all the way to first year college theory. 2. Theory Made Easy for Little Children by Lina Ng (two volumes). Aimed at ages 4-7. These two colourful/fun books are available at several online shops. Here's one sample listing. 4. Basic ear-training and music theory workbooks for all ages with CDs: This is the Canadian workbook series: Sound Advice. This is the music theory and ear training books recommended by my fellow Conservatory teachers for their string players. 6. For teenaged or adult flute students: This one sounds TERRIFIC!! "Keyboard Theory" in 3 volumes by Grace Vandendool. Volume 1 is called "Basic Rudiments." Published by Frederick Harris Music." 8. Online self-teaching theory courses (free) are at these links. All levels Music Theory and music term dictionary. Please use the comment button to add your own titles and thumbnail sketches of useful books you've used for flute students, and add to this rich list of texts and resources. Please forgive me if I should have posted this somewhere else. I've searched and searched the blog and I couldn't find anything about my question. I am having trouble with something and I'm not sure if I'm over thinking myself or if I'm just doing things wrong and have been all along or what. I used to play the flute and recently started up again about a year ago after a long break. I never recall learning counting with the word "and". I always learned, 1, 2 3, 4(4/4) and 1-2-3 (for 3/4). maybe because it was more simple stuff? I don't know. But recently upon learning more complicated dotted eighth notes and sixteenth notes and stuff my private teacher said that I basically had the rhythm but my notes weren't counted equally enough. She said I need to count with "and" when doing eighth notes so they are exactly equal she confused me even more. I am aware of the "and" counting but I always sort of avoided it and now I am going crazy. I understand how to actually play the rhythms aloud on the flute, or clap them out, but not count them in my head.. if that even makes sense?! How can I use "and" and tap the beat at the same time. I just don't get it! I mean, when you play do you actually think "1 and 2 and" in your head or is that just to get you to learn how the rhythm sounds? I try and I just can't keep the beat when i do this and I feel like I can't concentrate on the dynamics and technique! I did see your PDF on rhythm, and I understand it but I just can't do the "and" thing in my head! Sorry if this is a confusing or annoying question. And sorry for rambling on. I think that it's simply unfamiliar to you to say "And" to count eighth notes. Why be so hard on yourself, when it's completely new? Instead, take some time to let it become familiar. Take a recording device to your lessons, and record your teacher counting "one and two and three and four", and ask if she/he can help you by counting long enough for you to "get it". Give yourself time to absorb it all. To further on Jen's ideas about rhythm I have been talking to a friend of mine who an amazing percussionist about how to improve my overall rhythm as well as how to tackle orchestral excerpts and making them very accurate rhythmically. One trick you can use is to play with the metronome on, but have that beat line up with the "and" (not the downbeat). It is difficult, but once you can do it playing it normally gets a lot easier and more in time. Also, in preparation for auditions have a friend sit there with a metronome on silent while you play and they tell you every time you get off the time. This is also very frustrating, but it is a good way to improve in a short period of time. Flutist vs. Flautist argument lasted only about 48 seconds. Do your research first, wot?